Part of how the “out-of-this-world” feel to the game is established is via Arthur Roolfs’ space-age synthesiser score. Roolfs, a musician and software developer with RoGame, has composed 4 cues to support the “out of this world” feel to the gameplay set up with the tiles-as-planets and HST images. 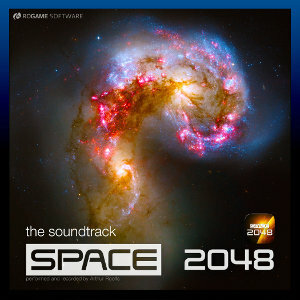 Space 2048 begins with the 10-minute track, “Space Theme”. The cue starts quietly and takes a single short idea on synths as a base and adds variety by modifying the motif’s tune slightly and by altering its rhythm. The whole effect is tuneful and quite hypnotic. There is then the addition of several more thematic pieces which are layered over the top of the original motif. Each additional layer is added in a staggered way, allowing the combination of 2, 3 or 4 (etc.) ideas to be heard before the next layer is built up. The inclusion late on in the cue of a bass rhythm adds a nice bit of variety to the other, higher pitched parts. Although undeniably interesting, the track does run slightly too long meaning that my attention did tend to wander towards the end. “Space Pebbles” and “Space Worms” continue the strong rhythmic feel to the soundtrack, particularly with the latter cue which focuses on combining a couple of attractive rhythms which leads to the creation of a series of interesting combined rhythm patterns. Again, the addition of a bass synth pattern to the cue adds tonal variety. This all makes “Space Pebbles” the most entertaining track on the album. The 25-minute album ends with “Space Worms”, a track which uses dense synth chords in combination with a light-hearted rhythm pattern. However, this wash of chords and the harsh quality of a synth line added towards the end of the track, makes for a disappointing end to the album. This is particularly true since the preceding track, “Space Time”, is the least interesting track on the album. “Space Time” does away with the strong rhythm patterns and concentrates more on creating waves of sound, adding an eclectic mix of electronic tones and topping it all off with the addition of a synth chorus. Roolfs’ score for Space 2048 is very much dedicated to creating a series of soundscapes suitable for a game which is designed to pass the time rather than aimed at killing a myriad of aliens or enemy soldiers. There’s little emotion aspect to the soundtrack other than the music being pleasing to listen to – or not. For those who like their synth rhythms both “Space Theme” and “Space Pebbles” will reward but, overall, the score is disappointing after the promising start. Space 2048 can be streamed or downloaded for free at the composer’s Bandcamp page, HERE.